With patent stocks being all the rage in 2012, the recent deal for Spherix (SPEX) to purchase a bunch of patents created by the Harris Corporation has basically gone unnoticed. Possibly because the company was mostly unknown prior to this pending deal or possibly the leading patent stocks of VirnetX Holding (VHC) and Vringo (VRNG) have struggled this year thereby lessening investor appetite. The recent news on quickly closing another patent deal with Rockstar has again jumpstarted the stock after the original news had faded sending the stock to new lows. Spherix is in the process of launching a broad IP monetization initiative adding to its drug development and patenting expertise. The company has identified a couple of undervalued IP assets that it plans to generate value for shareholders through licensing and enforcement. Though Angie’s List (NASDAQ: ANGI)continues to produce extremely fast revenue growth, the market was disappointed with the forward guidance for Q3. The provider of verified user reviews showed a large increase in operating leverage though the level of losses might continue to scare off investors. When reviewing the quarterly results for Republic Airways (NASDAQ: RJET), a couple of numbers really stuck out as shocking and actually in a good way. The company reported the amazing combination of lower revenue yet higher operating margin. What is going on in the airline industry that is allowing this focus on profits? Though the stocks haven’t traded well the last couple of days, costs cuts have improved the potential for rebounds in both Peabody Energy (NYSE: BTU)and Walter Energy (NYSE: WLT). Peabody easily smashed estimates while Walter provided hope that a liquidity crisis wouldn’t smash the stock. Disclosure: Long ANR. Please read the full disclaimer page for more details. Will the Facebook News Finally Get GSV Capital Back to Book Value? With the bullish results from Facebook (NASDAQ: FB),will it push GSV Capital (NASDAQ: GSVC) back towards book value? The stock trades considerably below book value due partially to the poor results of that stock in the public markets. The company is a publicly traded investment fund that specializes in venture-capital backed pre-IPO firms. A day after absorbing an 11% loss, Allegiant Travel (NASDAQ: ALGT) shareholders should spend a minute reviewing the results that caused the selloff. Were the second quarter numbers really bad enough to justify the stock plunge? The company focuses on low-cost travel to leisure destinations and has seen a dramatic stock increase since the middle of 2011. A typical headline such as the above usually signals a stock that has an absurdly high valuation and that is due for a correction. In the case of Walter Energy (NYSE: WLT), the amazing part is how low the market cap has dropped. This stock was a poster child of the commodity boom and has collapsed around 90% in just over two years. Anybody following this blog knows that Stone Fox Capital has been bullish on airlines for a while now due to all of the consolidations in the industry. The lower competition has made the industry attractive for possibly the first time in the history of the industry. The below airline analyst from Wolfe Research makes some interesting points regarding the airline industry and oil prices. Interesting to see the point regarding the hedging book as being a liability. Basically unless you're the best hedger in the industry, all a hedge does is rack up expenses over time. The best part was possibly the Fast Money guy knocking down the value on the airline stocks while the research analyst was clear that the stocks remain dirt cheap. Will Yelp Become the Next $10 Billion Social Media Company? As investors ponder if Yelp (NYSE: YELP) is overvalued at $42, the big picture needs to be considered. The company has a market value of $2.7 billion and revenue that will only cross $200 million this year. While it might be difficult to envision it as worth $10 billion at this point, the company appears to have all the makings of a future that big. The recent results of United Rentals (NYSE: URI) don’t bode well for the results of equipment manufactures such as Terex (NYSE: TEX) or Manitowoc (NYSE: MTW). United Rentals claims the largest equipment rental company in the world, operating 824 rental locations in North America. At the recent investor presentation in June, Wendy’s (NASDAQ: WEN) gushed about all the positives of brand reimaging, bringing amazing benefits to updated stores. In fact, some of the initially updated stores saw a 25% increase in revenue that came from higher traffic, as prices haven’t been raised. When reviewing the airline sector, the moves made by Republic Airways (NASDAQ: RJET) appear to be all the right ones. In an industry long focused on market share and size, the airlines as a group have undertaken a new dedication to focusing on profits regardless of market share or supposed industry importance. As domestic oil surges above $100 and natural gas supplies drop below 5-year averages, now could finally be the time to own C&J Energy Services (CJES). The company went public just as the boom in shale drilling peaked and the stock has suffered. Instead of sitting still, the management team has been aggressive with a major acquisition and continuing to build out equipment fleets that have hurt short-term profits. In the long-term, the company could be poised for a strong rebound when the market recovers. C&J Energy Services is an independent provider of premium hydraulic fracturing, coiled tubing, pressure pumping and wireline service with a focus on complex, technically difficult well completions. Disclosures: Long CJES and WFT. Please review the disclaimer page for more details. As quickly as SodaStream (NASDAQ: SODA) finally gained some strong interest from the market, the analyst community smashed the stock with downgrade after downgrade. The company continues to under promise and over deliver, with results beating expectations quarter after quarter. The stock, though, has plunged $18 in the last month and now trades at less than its growth rate that has been reaching over 30% lately. This is the second part of a series reviewing the large number of IPOs pricing below the original midpoint, with a record five on June 26 alone. One of the best ways to find values in a market is to locate stocks ignored by the market. During weak market periods, IPOs can quickly become overlooked as risk appetite disappears so investors bypass the unknown new issues. The last week of June produced a large number of IPOs pricing below the original midpoint with five on June 26 alone. Wendy's (WEN) has long had good fast-food, but the decor has been outdated for well over a decade now. The fact that the old stores still require waiting inline for a refill is very outdated. At least for my family, Wendy's has become a drive through store with no appeal for dining in. Possibly this new makeover will make it more appealing. Has anybody visited an updated location? Bernstein Research provided a compelling list of prospects in the software area that could become merger and acquisition targets. The research firm has provided a list of fast growing software stocks over the years that have a high level of buyouts. Analyst Toni Sacconaghi provides an interesting case for why hardware companies might be interested in these software players. As volatility picks up and funds start flowing into equities, several financials are becoming more interesting as investment options. During 2013, money has started flowing into equity funds after years of massive outflows into fixed income funds. Some interesting stocks to follow are Interactive Brokers (NASDAQ: IBKR), Janus Capital Group (NYSE: JNS), and Virtus Investment Partners (NASDAQ: VRTS). Anybody that has invested in Fusion-io (NYSE: FIO) since the IPO back in 2011 probably has given up on catalysts for a rebound. The stock originally plunged as top customers Apple and Facebook supposedly reduced spending for the short-term, yet it has now led to the founders leaving the company, further questioning its growth potential. As the financial markets rebound, asset manager Legg Mason (NYSE: LM) would appear a strong candidate for a rebounding stock. As investors shift more funds into equity funds that collect higher fees, the general asset management category should see fee growth. Anybody that has invested in Zynga (NASDAQ: ZNGA) since the IPO back at the end of 2011 probably doesn’t see many potential catalysts in the stock. The company was a massive hit with social games such as Farmville and has a strong franchise with Zynga Poker. Yet as the excitement over social games dies down, the company now has several catalysts that could push the stock higher. Below are two charts highlighting the monthly returns of the top 10 stocks from June (see list here). Due to limitations with YCharts, the chart was broken into the Top 5 and Next 5 lists. Disclosure: Long AMP, DTV, KSS, WPL. Please read the disclaimer page for more details. Interesting infographic off all the products that Google (GOOG) has killed over the years. The company continues to build product after product yet search is the only real money maker. The Android operating system is clearly successful, but it still isn't a cash cow like search. Even though a lot of the small cap growth stocks still struggled, the Russell 2000 Small Cap Index closed above 1,000 for the first time. The index has surged after trading below 750 last summer. 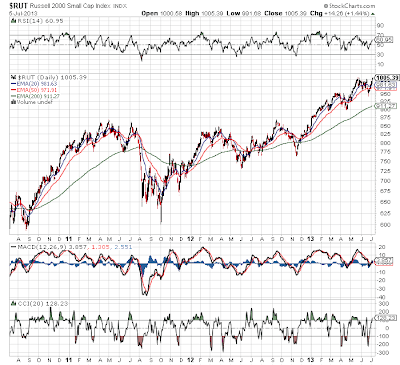 As the below chart shows, the index appears headed even higher as a breaks out of the recent range. As riots erupted in Brazil over the last few weeks, the stocks trading on US exchanges have collapsed. In fact, the Brazil iShares Index (NYSEMKT: EWZ) fell from around $54 to $40 over a few weeks during June. Even worse, the index peaked out around $75 back in early 2011. Over two years later and the index still remains in a downtrend as domestic stocks soar. As report after report continues lamenting the fact Facebook (NASDAQ: FB) is losing the younger generation, investors have turned content with the stock. Does a disconnect exist between older investors and the younger crowd? Or is it possible that Facebook can overcome the loss of the younger crowd unlike other social networks in the past such as MySpace? The major buyback by American Capital, Ltd (ACAS) continued unabated in the second quarter. The company announced it has now repurchased 70.4M shares since shifting from paying dividends back in Q3 2011. The total buyback has amounted to $748M over the last 8 quarters at an average discount to a continuously soaring NAV of nearly 40%. Nonetheless, the stock continues to trade at a substantial discount even after demonstrating to the market every quarter that it has the financial ability to spend that much cash. According to the recent monthly results, bankruptcy has been good to AMR Corp. (NASDAQOTH: AAMRQ.PK). The company just reported a dramatic turnaround from last year for May and should signal that the combination with US Airways (NYSE: LCC) will be a very profitable one. As the global economy struggles along especially in emerging markets, the domestic engineering firms have seen revenues and profits stagnate this year. Ironically, an unlikely source is now contributing to huge growth expectations over the next couple of years. The shale gas revolution in North America is pushing LNG export projects, and ammonia and ethylene plants back to the US where chemical construction projects had dried up for decades. In the case of KBR, Inc (KBR), analysts expect dramatic earnings increases in out years while the stock still trades at a below market multiple. The company is off to a good start with FEED work on a couple of LNG export projects in British Columbia and the recent announcement of a $600M ammonia project in Louisiana.